Go with Indigo colors and give a calm and serene touch to your home. Decorate your home with this beautiful handmade block printed cotton dhurry which will assure you to make a focal point, once placed in your home. - Block-Printed Cotton Dhurrie rugs from India to give your home a new direction. - Beautiful, elegant and easy to maintain. Completely handmade with natural dyes and colors. - Ideal for space with light interiors. Vacuum regularly in the direction of the pile of the rug. Clean liquid spills immediately with a damp cloth or sponge. For hard to remove stains, professional rug cleaning is highly recommended. 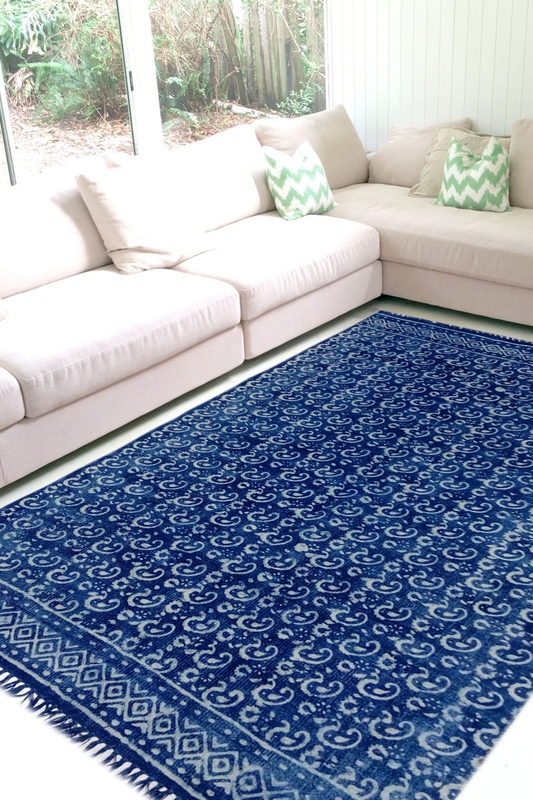 Avoid direct and continuous exposure to sunlight.All of our Rugsandbeyond rugs are professionally washed and are individually inspected before leaving our warehouse. This rug is currently in stock and includes FREE shipping worldwide.